I love Mondays, and I love making things. 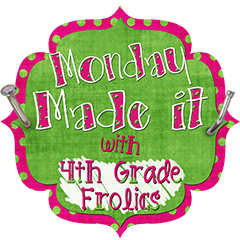 I am linking up with 4th Grade Frolics for Made It Monday! I started by covering a canvas with newspaper using Mod podge. Then I placed letter stickers to say "Sail Away With Me" over the newspaper. I painted over the letters and newspaper with blue paint. When I removed the letters, you could see the newspaper underneath! We will have this next to the gift table during her bachelorette party. So cool Michelle! We are thinking about doing a "Tank it Tuesday" because we can't ever finish anything we've started for the Make it Monday!!! Wish I had some time to work on my own craftiness. Love the way the sign turned out! Its going to be a gorgeous centerpiece for your friend's party! Your sign looks great. I love the newspaper look of the letters. I love your Sail Away With Me sign. We have a sailboat and I'm going to try to make it:) So glad I found your blog.